Recently I was reminded of an evening in my youth, sitting around with a couple of friends reading a copy of Byte. It was sometime in 1987 or there abouts. One of us spotted a brief news item about some breakthrough in storage technology that promised an amazing amount of data on a small chip. I forget the specifics but we sat around and did some maths based on the sketchy details in the magazine and a few assumptions. We came to the conclusion that if this technology actually worked out you could store more text on a 20x20mm chip than you would read in a lifetime of novels. Imagine that, being able to store your lifetime library in something the size of your thumbnail. Mind boggling! For context, this was a time when buying a 10Mb HDD was not a silly idea, and 40Mb was impressive (yes dear reader Mb, not Gb or Tb). And they were not small devices. Of course, the news article was about research that might be years away, if it even worked at all. But we could dream. What an amazing world we could end up living in. Having been reminded of this I decided to do the maths again. I grabbed a paperback of the era and started counting. Lets say 70 characters per line and 40 lines per page, so 2,400 characters per page. Lets assume a simple 8 bit character set, so one byte per character. Wow, that’s a big number. But actually no, it is a small amount of storage by today’s standards. Less than 16Gb, about 1/250th of the storage capacity on the desk in front of me. Just right to fit on a small USB stick (although you might have to buy a pack of 3 or 5 if you want to buy 16Gb devices). 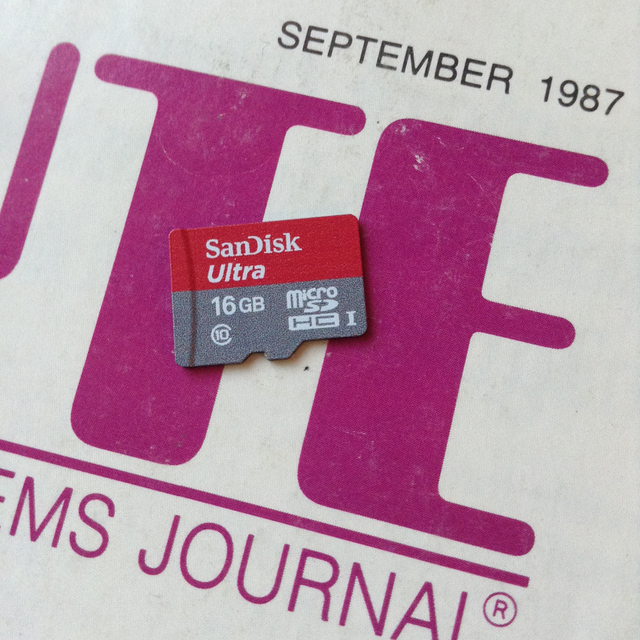 Or just right for a Micro-SD card, which coincidentally is almost exactly the size of my thumb nail. Depending on format I can go to the local supermarket and buy a 16Gb something for less than $20. Looking at the ads in the back of a 1987 Byte, buying 16Gb worth of 40Mb HDDs would have cost US$240,000 (plus shipping), around A$330,000 in those days. This is nearly three times the median house price in Sydney at the time! How things have changed in just 30 years. A lifetime of reading on your thumb nail for less than the cost of a decent family sized pizza … we do indeed live in a truly remarkable world.